Sky’s Guide Service is owned and operated by Skylen Freet. Sky’s passion for fishing and the outdoors started at the tender age of 5 when his grandfather first introduced him to the joy of fishing. By the age of 12, Sky was running his first boat, a 1963 Crestliner with an old 35 hp Johnson Sea Horse outboard motor on the back. Back in the early days while fishing with his dad, brother, cousins, and friends, Sky soon realized what his true calling in life was. While it was fun catching fish on his own, the most enjoyment came from helping others to hook fish and watching the expressions of pure happiness on their faces. After graduating from college with a degree in philosophy, Sky made fishing his lifelong philosophy in 2000 when he started guiding in Alaska during the summer months. 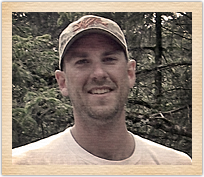 While spending his winters on the Sandy River in northwest Oregon, Sky realized the possibilities of a year-round guide service in 2005 when he started Skylen Freet Guided Sportfishing, LLC and started guiding professionally in Oregon under the name Sky’s Guide Service. Today, Sky’s Guide Service offers world class fishing opportunities for Salmon, Steelhead, and Sturgeon at multiple locations in Oregon’s most productive fisheries. From the Columbia River Gorge to downtown Portland to the Oregon Coast, Sky’s Guide Service follows the bite to give you the best opportunity at that once-in-a-lifetime fish. Whether you’re after a trophy Chinook Salmon, one of Oregon’s famous Steelhead, or a prehistoric Oversize Sturgeon, Sky’s Guide Service offers a fishing adventure that’s just right for any age or skill level. Come join Sky today and experience some of the finest fishing the Pacific Northwest has to offer. Sky is a member of the Coastal Conservation Association, Association of Northwest Steelheaders, NW Guides & Anglers Association, Northwest Sportfishing Industry Association, and Tillamook Anglers.